Led Zeppelin's fifth studio album is a mixed bag of complex and experimental music, spread out over two discs, 15 tracks and almost 80 minutes. 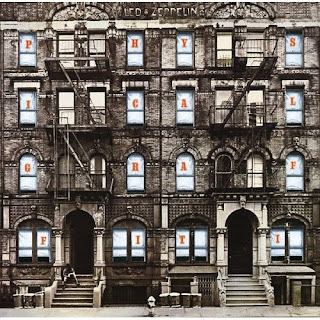 A mix of strong metal and unclassifiable music with a sound that only Led Zeppelin ever produced, Physical Graffiti is a tall tower that looks different depending on which angle its viewed from. The first disc is more impressive, and features some of Zeppelin's most complete songwriting. The Rover is a hypnotic dance metal track, John Bonham pounding his drum set into the ground, while Jimmy Page takes off on a teasing, sleazy riff. Continuing the dance theme, Page and Bonham combine again to create an irresistible groove on Trampled Under Foot, six minutes of an almost continuous beat that challenges the commitment of any immovable object. Custard Pie is a solid opener, while In My Time Of Dying, at eleven minutes, is uneven to say the least, but its faster segments erupt with some of Page's most energetic metal guitar work. Kashmir closes out the first Disc, one of Zeppelin's heaviest tracks, a trudging, destructive, 18-wheeler of a song, over eight minutes of menacing eastern-tinged metal that threatens to run over anything that stands in its path, once again riding on the brutality of Bonham's drums. Disc Two is a different story, and focuses on Zeppelin's unique ability to create their own genre of soulful rock. The nine tracks contain interesting material, but the band appears to take a deliberate sharp turn towards a more mellow attitude. In The Light and Ten Years Gone are complex, layered and emotionally engaging songs, but while they contain metal elements, their overall classification is simply Zeppelin: a unique, unrivaled sound, defying any specific or individual genre. The Wanton Song makes an appearance on the back half of Disc Two to throw another kiss towards the band's relationship with metal, but then Boogie With Stu, Black Country Woman and Sick Again ensure that Physical Graffiti ends with what can only be called glorified filler. 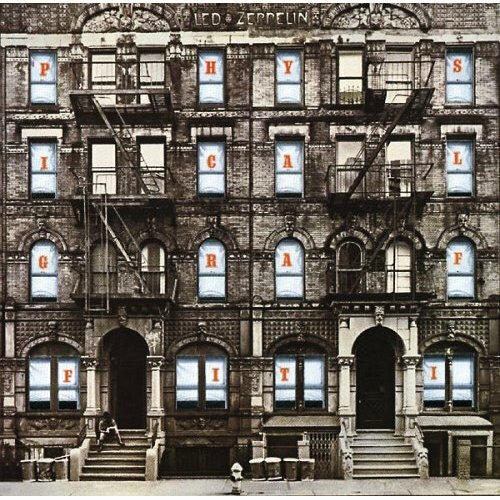 Physical Graffiti is Led Zeppelin's most ambitious album, and while it contains some less than stellar material, it is the most comprehensive summary of the multi-faceted essence of a most complex and gifted band.